After jewelry, hats are my favorite accessory. Straw, fedoras, caps, floppies, visors, cowboy, beanies, ushankas – you name it, I dig it. 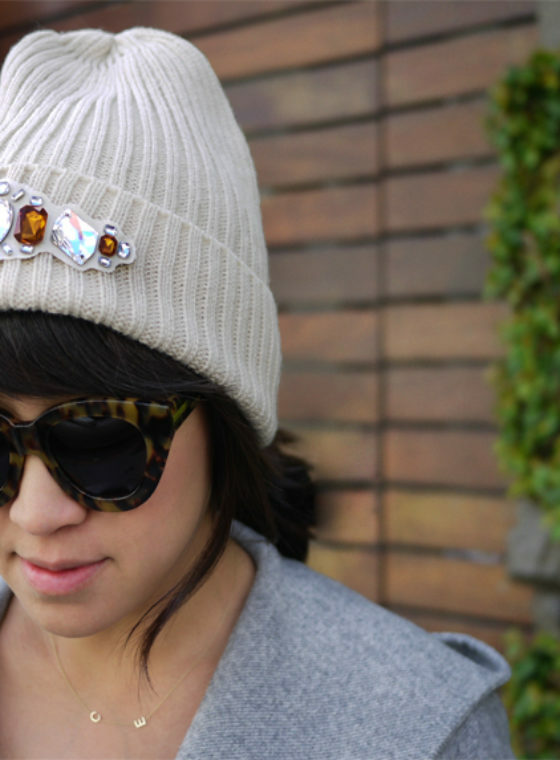 And just like jewelry, le chapeaux has the ability to relieve just about any wardrobe slump. 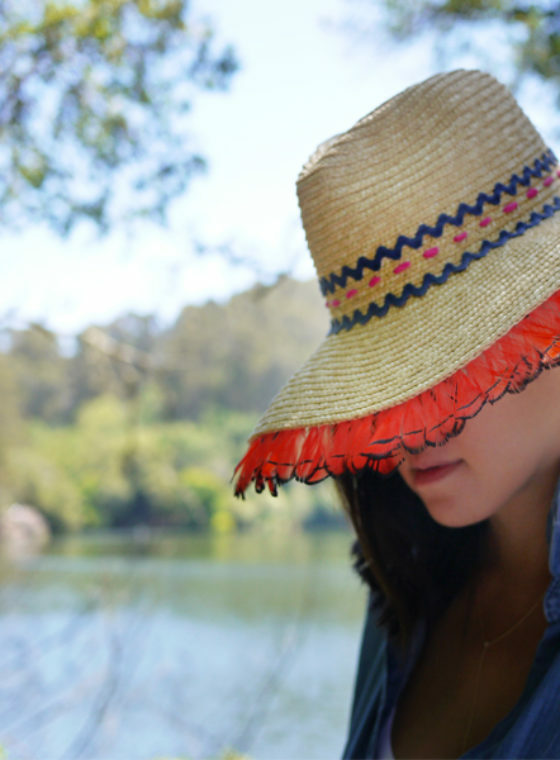 This week, I’ll show you how to transform a simple floppy hat into something similar to Eugenia Kim‘s fabulous feather trimmed version in under 15 minutes. It’s that easy. Honestly. Remove any bows or bands around the hat. They were most likely attached using glue, which is very easy to remove from felt. 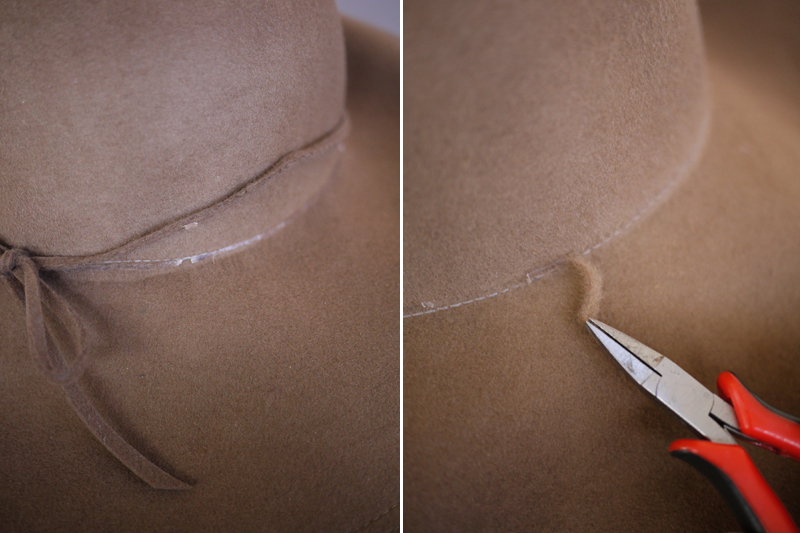 Simply use a pair of tweezers or pliers to peel the glue from the hat. Felt is very resistant so this shouldn’t do any damage to the hat at all. 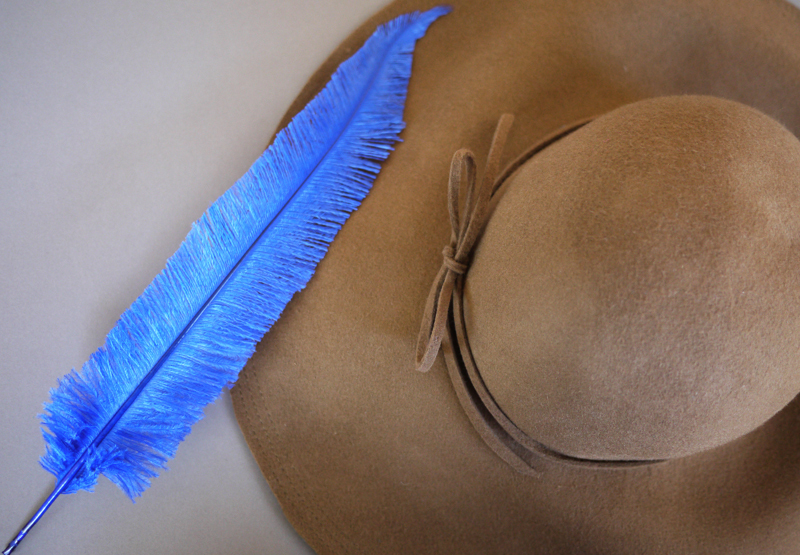 Place the feather around the base of the crown of the hat for placement. 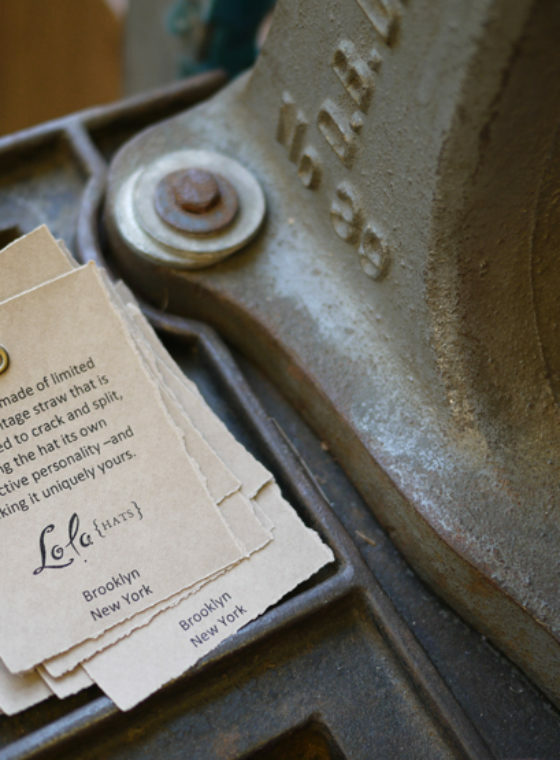 Using a pen, make a tiny mark where the base of the feather starts and another at the tip of the feather. Run a thin, consistent line of hot glue along the base of the crown and between the two marked points. Hold the base of the feather with one hand and the tip with another. And working quickly while the glue is still hot, place the spine of the feather directly on the line of glue. Hold it in place for several seconds until it dries. 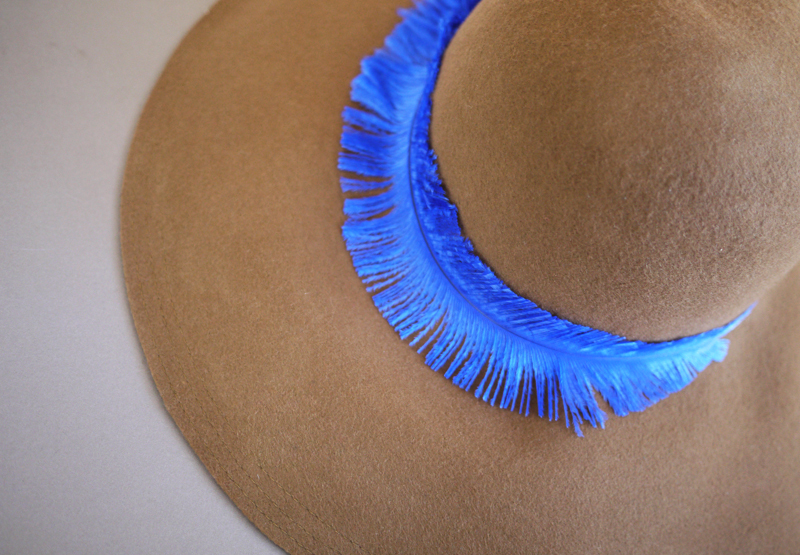 And just like that, you’ve made a feather trimmed felt hat. 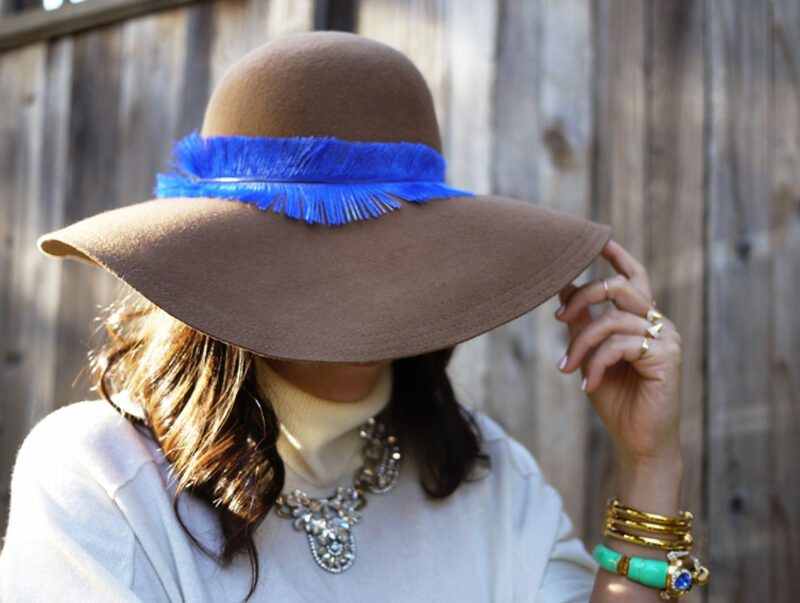 Try different colors or even multiple layers of feathers. Have fun! Great DIY!! Love the blue with the tan fedora!! 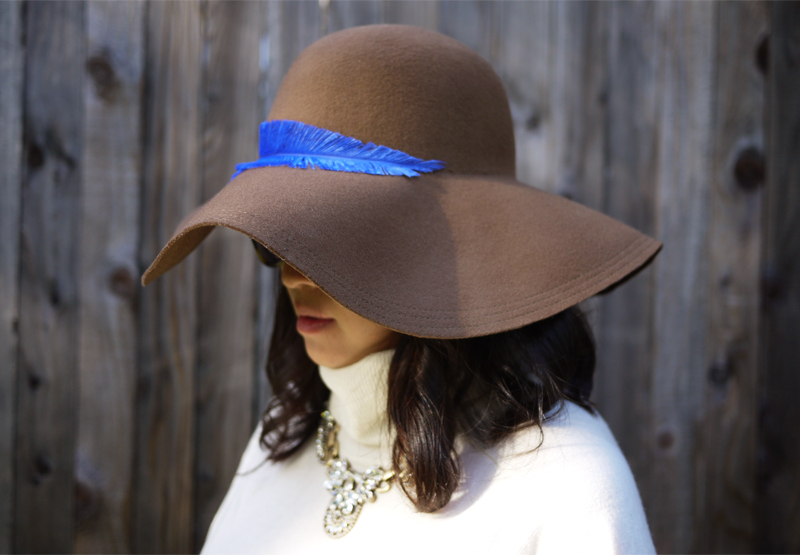 i love hats too, and this is a fabulous (and super easy) way to enhance a floppy! This hat is adorable and with your tutorial I think even I could manage this! It’s very original and so pretty. Very nice DIY. That looks ncie and I always do something creative. I like posts like that. Have a great day. Awesome DIY! Adds a great pop of color! Just posted a DIY on my blog! What a simple but effective idea, I don’t suit many styles of hats but I love the splash of blue! 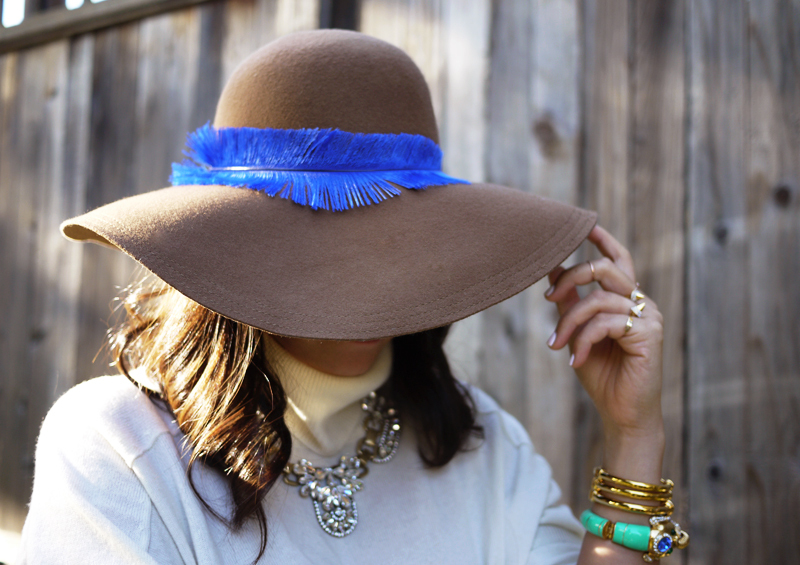 I love that you did such a bright feather on a tan hat. It’s bold and artistic. I also really like how the feather doesn’t go all the way around the hat. ohh i aodre this one!!! We love it! its so original! I love that the hat is bold, but still wearable. Lovin’ it. I see more DIY hat projects in your future. Maybe something with sequins next time? That is just too cute….. 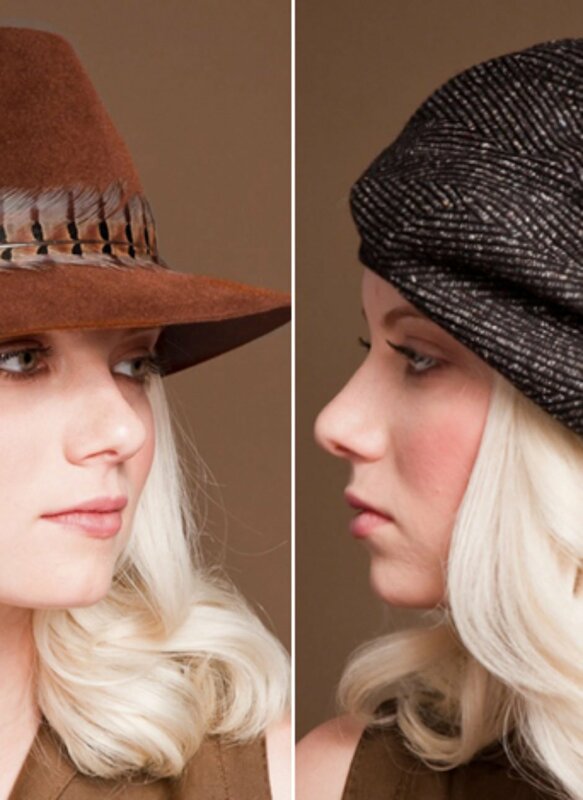 Seems like an easy but glamorous project that will revamp any hat! I’ve been dying for a felt hat and this one is beautiful. I am really getting into crafts again recently and looking through your blog has given me some great inspiration. I might miss this one though as I am yet to find a hat which looks anything close to good on me! a bit unrelated, but where did you get that necklace?? 🙂 it’s gorgeous! Anyway, i can’t help but notice that the model wears amazing necklace and bracelet. Where did you get it? Or maybe you can make a DIY tutorials on those? That will be lovely! Love all your ideas! Have done your bracelets thanks to your very clear instructions and great photos. Thank you for a great blog! I’m hooked. PS the hat is wonderful but also love the necklace and bracelets the model’s wearing. Where are they from? Thanks for the link to our “nandu” page. Nandu is a term for trimmed ostrich feathers of the style used in this creation. What a marvelous way of dealing with hats! I love it! !